Coffee Break Bible Study for women and Story Hour for preschoolers will begin on Tuesday, Sept. 18 at 9:45 a.m.! We will be studying several New Testament books this year -James, Philippians, Ephesians, Philemon and Titus. No previous Bible knowledge is needed. There are Bible stories, crafts, playtime and singing for kids ages 2 - 5 yrs. old and a free nursery for infants. Please see below for more information. Coffee Break is a ministry to women and preschoolers. All women and children (ages 0-5) are invited to join! Coffee Break is a group of women from the community who come together for a time of sharing, prayer and fellowship. This small group Bible study invites women into exciting first-hand discoveries of Bible truths. No previous Bible knowledge is required. 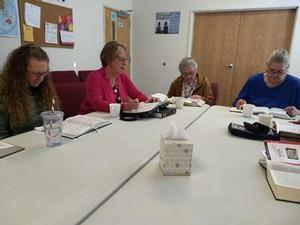 We meet every Tuesday morning from 9:45 -11:00 a.m. We start out with a time of visiting while sharing coffee and snacks and then at 10:00 a.m. divide into 2 groups of women and spend the next hour studying God's word in a friendly, relaxing atmosphere. Please check out our Story Hour page to find out about the wonderful children's program for 2-5 years old that meets the same time as Coffee Break. We also have a loving, safe nursery for infants - 2 years old. Twyla Haringa is our Coffee Break Director. Please contact her at 509-837-5613 or email if you like to learn more about Coffee Break.